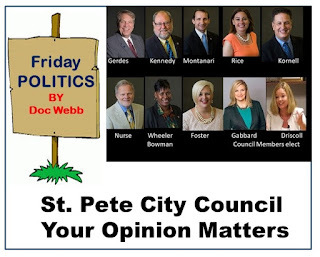 BAY POST INTERNET: St. Pete City Council Members can express a personal opinion. St. Pete City Council Members can express a personal opinion. When the City Charter allows it why are City Council Members reluctant to take a stand? For over a month, I have been trying to get a response from current and recently elected City Council members regarding their personal opinion about Mayor Rick Kriseman’s Chief of Staff Kevin King. See my post: Kevin King – It is time for City Council to take a stand. The City Charter specifically allows Council members to express their personal opinion concerning chief or higher management-level employees which would apply to Mr. King, who serves as the Mayor’s CHIEF of Staff. Sec. 4.05. - Administrative affairs; Council participation. As outrage grows, especially in the Democratic Party, about the sexual misconduct of public officials and the chorus of voices calling for action regarding people who are accused of improper conduct swells, it is time for City Council members to give us their opinion. Otherwise, we must assume that their silence endorses Mr. King and his past actions. Additionally, the failure of City Council to take a personal position on this matter could make it very difficult to discipline any other staff members or employees who commit improper acts or create a sexually hostile workplace. It would also seem that without City Council support, it would be very dangerous and difficult for victims and witnesses of improper activity to come forward.